Jesus goes to the synagogue to teach every day. There was a woman at the synagogue that could not stand straight for eighteen years. The woman’s back was bending and couldn’t stand straight because there was a spirit of infirmity that is oppressing her. When Jesus saw the woman, he called her to Him. Then Jesus reached out his hand and touched her. 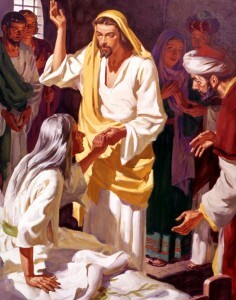 The spirit of infirmity left the woman and she was immediately healed. The woman can stand straight and she praised God about it. That day was Sunday, the Sabbath day when Jesus healed the woman. When the ruler of the synagogue saw Jesus healed on the Sabbath, they became angry. The crowd rejoiced for all the miracles that Jesus did and put shame to the rulers of the synagogue who accused Jesus.